Garage door openers can stop working correctly for a wide variety of reasons, and the assistance of a professional technician will usually be required if they need to be repaired. Our team will be more than happy to help you during such scenarios, and if you're looking to get a new opener installed, we'll be just as glad to assist you with that too. 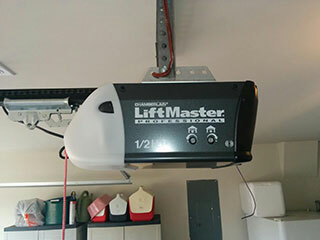 Before buying a new garage door opener, you'll want to make sure that you've taken everything into consideration. If this is the first time you're getting one of these units, you need to make sure that your garage has enough backroom to house an opener. Another important factor is the weight of your door. Your new unit will need to be able to produce enough horsepower to move the door, and the weight will determine if it will be able to do so smoothly, or not at all. While your opener is built to last, it's not built to last forever. Although it does have a finite lifespan, that can be increased by several years with the right maintenance. Our technicians can regularly inspect your opener and all of its parts, perform various adjustments and apply lubrication to all the necessary parts, which will improve the unit's functionality and prevent a lot of wear and tear. We also perform safety sensors testing, which will make sure that your automatic garage door is safe to use and that its reversal feature is working correctly. If your opener is making some strange whirring noises, but your door simply won't move, there may be something wrong with its motor. If seems to be failing to work but you can see any exterior issue, the circuit board housed inside the unit may be malfunctioning. Whatever it is, our technicians can handle it. We specialize in opener repair, and we can safely and easily replace worn out gears and fried electrical wires. Our team at Garage Door Repair Seabrook can help you with anything from opener installation to the most complex of repair tasks. Don't hesitate to call us for any related need.